I have a new neighbor. Designer Ian Farrier just moved to Seattle from Southern California. He said he wanted to live where there was some change in seasons. In Seattle, we are now in what is called the "really wet" season, as opposed to what you call "summer" and what we call the "wet" season. I hope you love it, Ian. 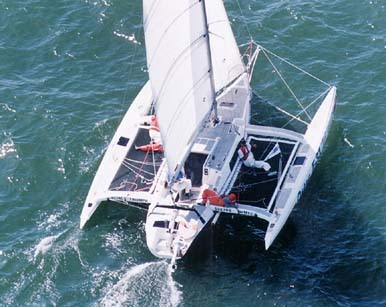 Ian is responsible for bringing us the F-27 and F-24 folding, trailerable trimarans built by Corsair Marine. 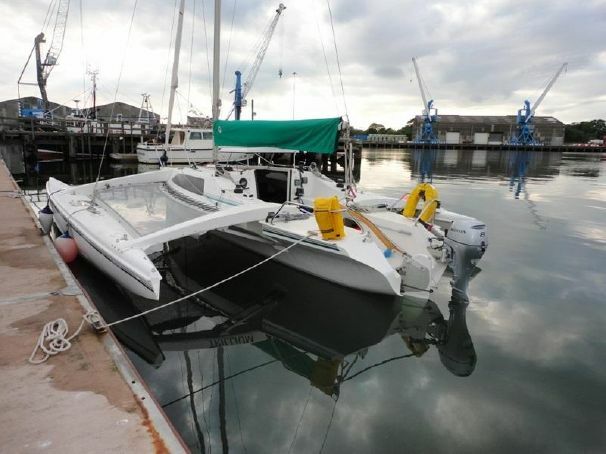 These boats have converted more sailors to multihulls than all the others combined, with the single exception of Hobie Alter's cats. The new F-31 is built in the United States by Corsair Marine as a logical step up from the F-27. Corsair has had an extremely ambitious production schedule for this boat with tooling on both coasts to serve the anticipated demand. Ian's approach to trimaran hull design uses a more moderate hull form than the narrow slivers that you see in the transoceanic races. The ultra-narrow tris are not very sympathetic to load carrying, and tend to increase their wetted surface at an alarming rate as they are sunk. 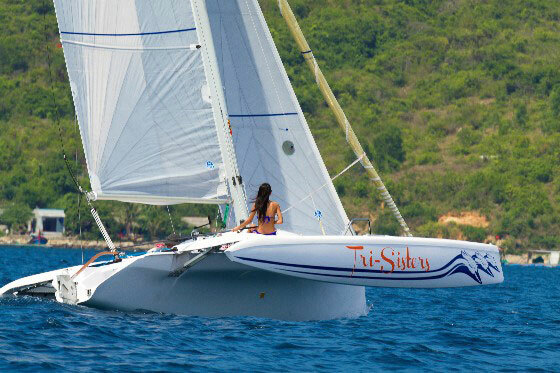 Farrier's hull designs are broader and flatter and much more similar to high-performance monohulls. The typical Farrier tri has useful hull volume and a near-planing boat shape to the hull. The topsides are gracefully flared to provide the volume required for the interior, as berth and settee flats follow the expanding volume. The amas are canted 8 degrees off the centerline of the main hull so that as the boat heels, the ama will show a symmetrical shape. One of the interesting aspects of this hull design is the profile. 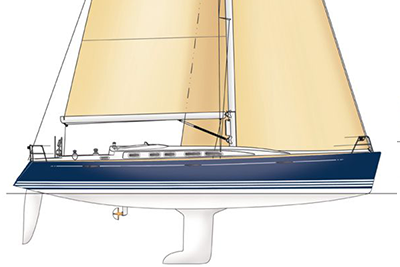 The daggerboard enters at an 18-degree sweep angle from just forward of the mast. In fact, it appears the mast is stepped on the aft side of the daggerboard trunk, which is convenient. 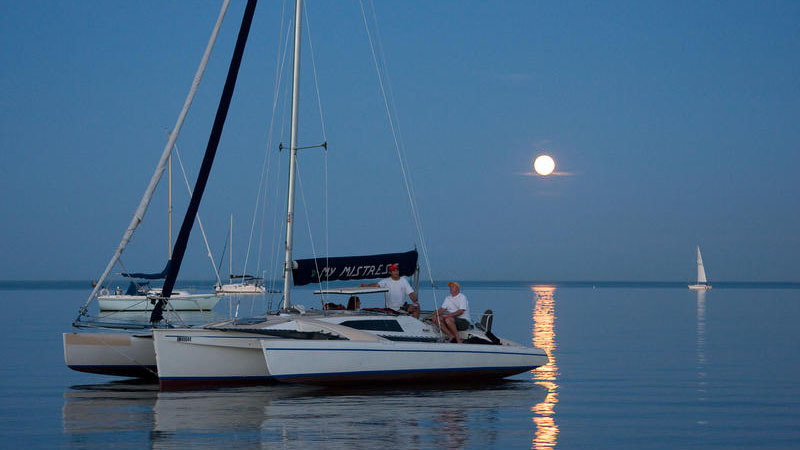 If you are new to looking at multihull designs, you should notice that while there are pragmatic considerations at work in the design of the center hull, the amas are designed for the lowest resistance for a given volume. On a racing tri, the displacement of an immersed ama can be designed to exceed 200 percent of the total vessel displacement. This is known as a "non-submersible" ama. Cruising tris can use "submersible" amas with less than 110 percent of the total vessel displacement in the ama. It is desirable to spread out this volume fore and aft in amas almost as long as the main hull. Specific to this Farrier design is the fact that the shape of the amas snuggles right up to the concavity in the main hull caused by the flare, providing for reduced beam while trailering. 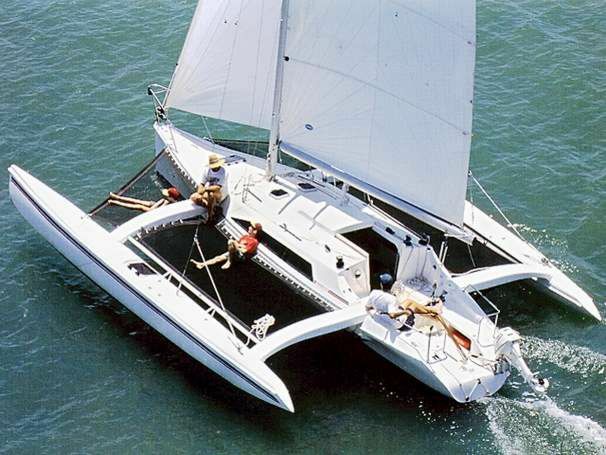 In looking at the accommodations, it would be better not to compare this design to a monohull with a similar LOA but, instead, to compare displacements. 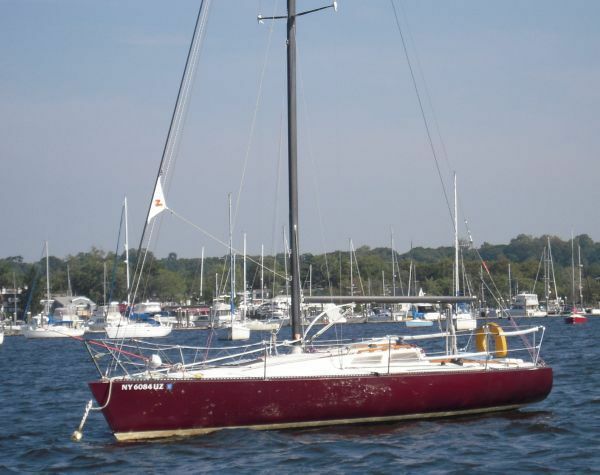 There is no question that the 31-foot Farrier tri has less interior volume than a standard 31-foot monohull, but you cannot trail most 31-foot monohulls. 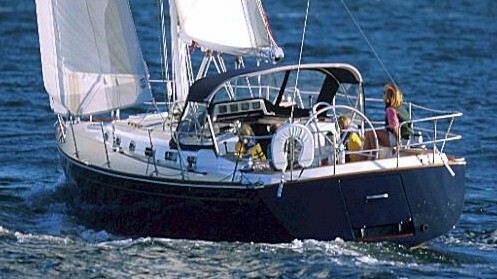 The F-31 has comfortable accommodations for two couples, and boat speed that will blow the doors off a 31-foot monohull. Note the double berth in the aft cabin. The Corsair Marine produced F-31 will have an interior well suited to American cruising tastes. The F-31 grew out of the F-9A, which was offered as a stock plan by Ian to amateur builders and custom shops. The biggest difference between the F-9A, and the F-31 production version is that the folded beam of the F-31 is less, to allow trailering to the U.S. max limited beam of 8 feet. Hull construction uses rigid PVC foam cores vacuum bagged to the skins. The beams are reinforced with carbon fiber. Power is provided by a 15-horsepower outboard that, in conjunction with the daggerboard and kick-up rudder, makes beaching this tri easy. Ian designs handsome boats. The F-31 is no exception. I could lay a bunch of race results on you, but most of them are from Australian races that mean little us here. 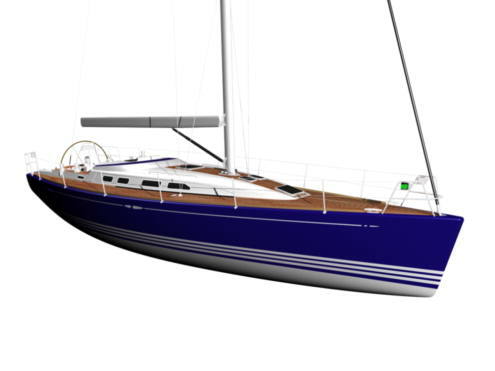 Just be aware that this 31-footer is capable of sailing with some big monohulls. If you like crunching the numbers, and knots-per-dollar interests you, you had better look twice at Corsair Marine's new F-31. Sail Area 599 sq. ft.